This post includes affiliate links and we may receive a commission if you purchase through those affiliate links in this post. While visiting Denia recently, we were reminded that visiting local hotels can be a great, and even non-touristy, way to experience the town. We’ve found that a beautiful hotel is not just for staying in. They can be great places to eat at and especially for enjoying beautiful, historical architecture and restorations. We know, seems counter-intuitive – hotels and tourism are one and the same, right…? 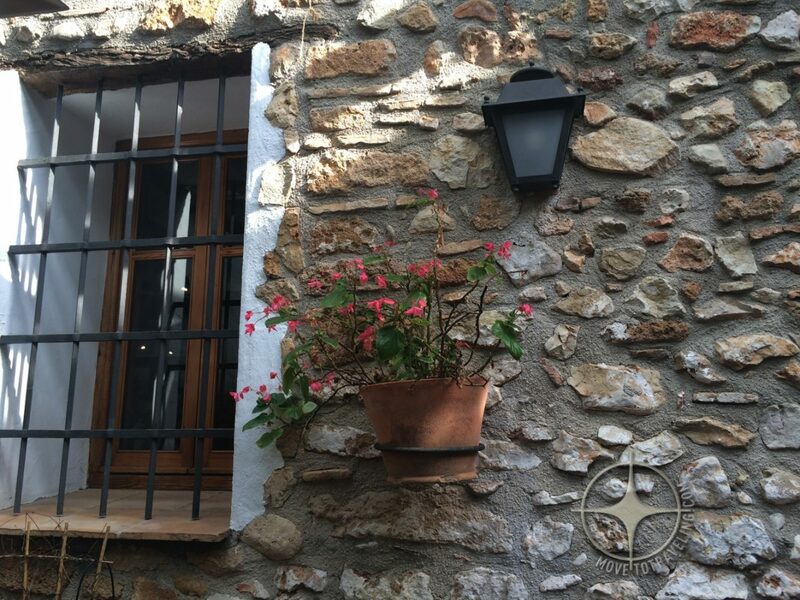 But the glimpse we got of the enchanting boutique Hotel Nou Romà really caused us to fall in love even more with this quaint, Spanish Mediterranean town. 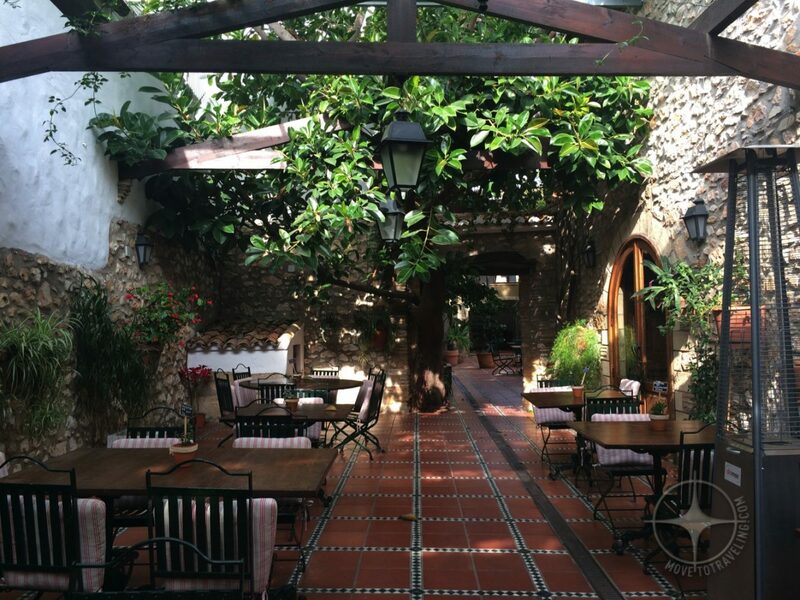 Whether you’re looking for a place to stay or visiting Denia for the day, let us share with you why stopping in at this hotel is a must for enriching your experience. We have been to Denia once before and have been wanting to return. So we jumped on the opportunity to visit the nearby town with our dear friend and neighbor Amparo. 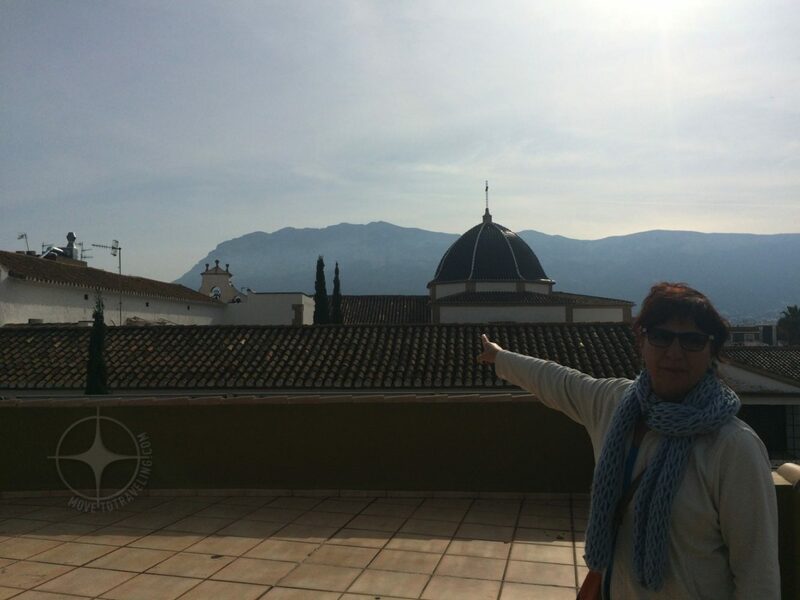 She showed us Denia as the kind of place where just being there in its midst, is wonderfully enough. You just find yourself wanting soak and drink it all in! Visiting Denia is one experience, but once you know Denia, you’ll understand what we’re talking about. Above Image – Meet Amparo. Going with Amparo gave us that ‘local’ touch. She is an amazing local artist, and stellar amiga, who has her art studio in nearby Gandia and is from the area. Thanks to some errands she wanted to run, we had our introduction to the Hotel Nou Romà. Here, she sells some of her custom glass art and jewelry and had the chance to restock them with new pieces. The location is just behind the castle and the large hill it sits on. All around are quaint small homes in rows of bright colors, wrought-iron balconies, and (our fave) Spanish tiled roofs. There are hills here, sloping the narrow little streets up and down, and the castle is viewable from almost anywhere, laid out impressively on the largest hill of them all. Yet we knew that if we had come on our own, we would not have known to look for the Hotel Nou Romà. The two entrances (located on either sides of the hotel) were nice, but we couldn’t quite tell from the outside just how magnificent it is inside. 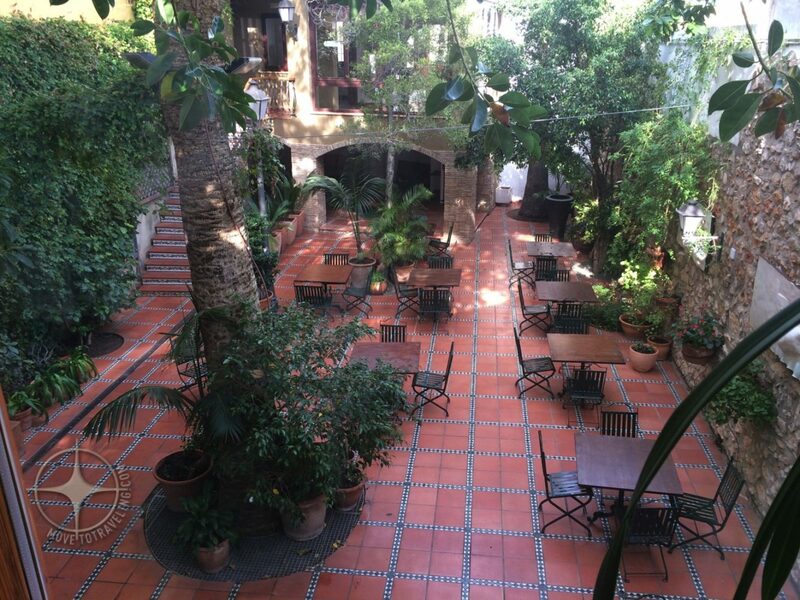 They warmly welcomed us in to enjoy their courtyard, the lobby and restaurant area, and even to tour their Suite. first into the romantic courtyard. Cue the iconic, European scene and all we architecturally love about living here! Thinking back on it, we are reminded of how magical an energy exist when hand-crafted spaces are treasured, revived and allowed to be dressed in nature’s beauty. Places like this remind us that nature loves to be intertwined with everything in its midst. A dark wood staircase with hand-painted tiles leads you down to this outdoor, ground-level courtyard, tucked snuggly between neighboring walls of old stone and bricks. The ground spreads out in large, ceramic tiles and draped throughout are lush, verdant green vines, plants and trees in all their glory. It almost goes unseen that there are the chairs and tables to sit at, for we would be happy to stand, or even lie on the ground, to soak it all in and gaze about. 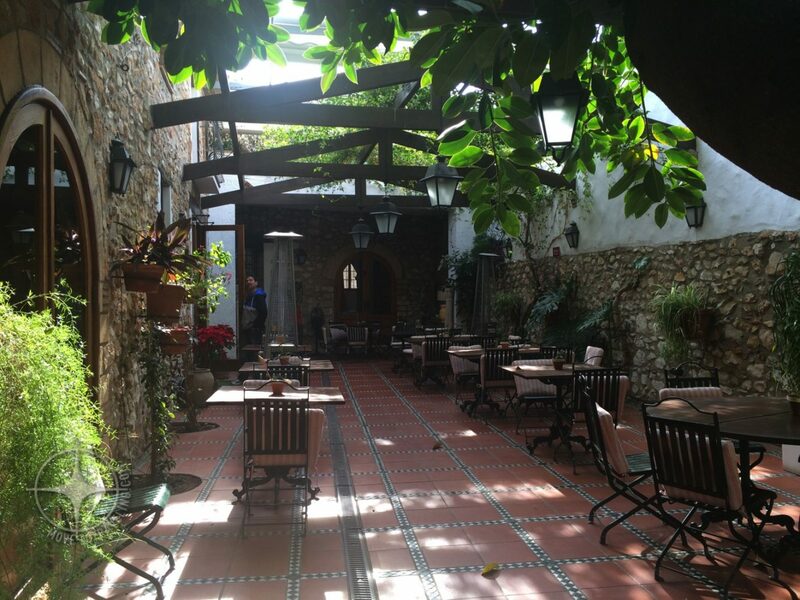 We did not stay for lunch, but saw plenty of people, guests and non-guests of the hotel alike, coming to enjoy what smelled to be a glorious meal at the hotel’s beautiful restaurant, La Senia de Federico. Before we left, we had the opportunity to see their suite room. 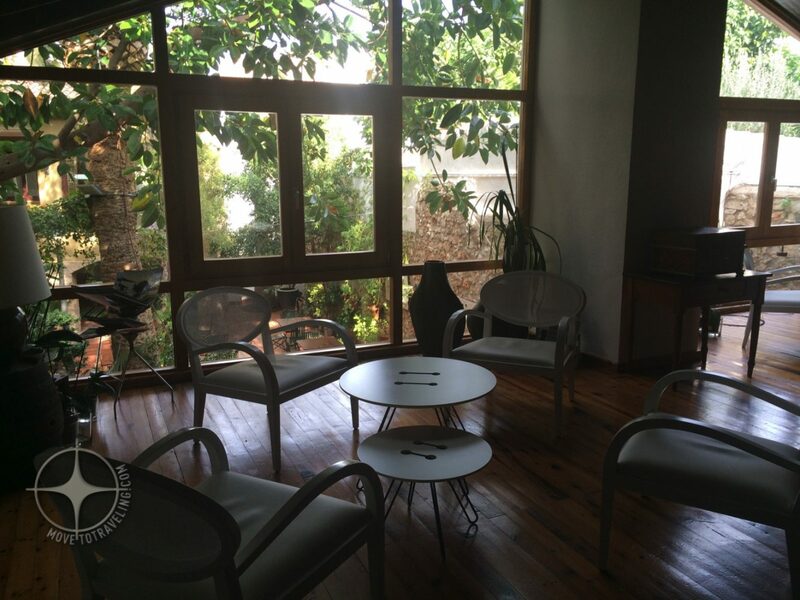 It was gorgeous, full of exposed brick, a private balcony lined with green foliage and bordered by bricks and Spanish tiles, a sala (or living area) and an impressive modern bathroom. We learned from their beautiful website that they have 11 rooms total. Enjoy staying at Hotel Nou Roma in Denia, Spain. Then we went up to the community rooftop terrace, which gave us 360-degree views. 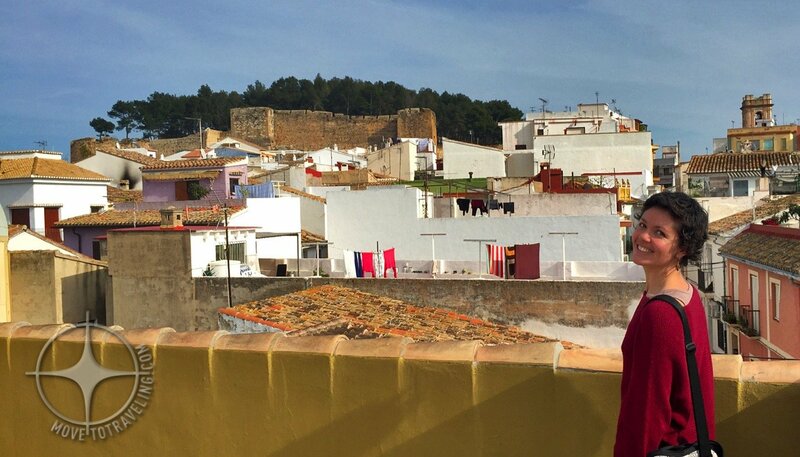 The castle on top of its hill loomed enchantingly nearby and it felt cozy, being nestled in among the neighboring buildings and their rooftops and terraces. Just across the street is the historical building of a small church called Agustinas Recoletas. 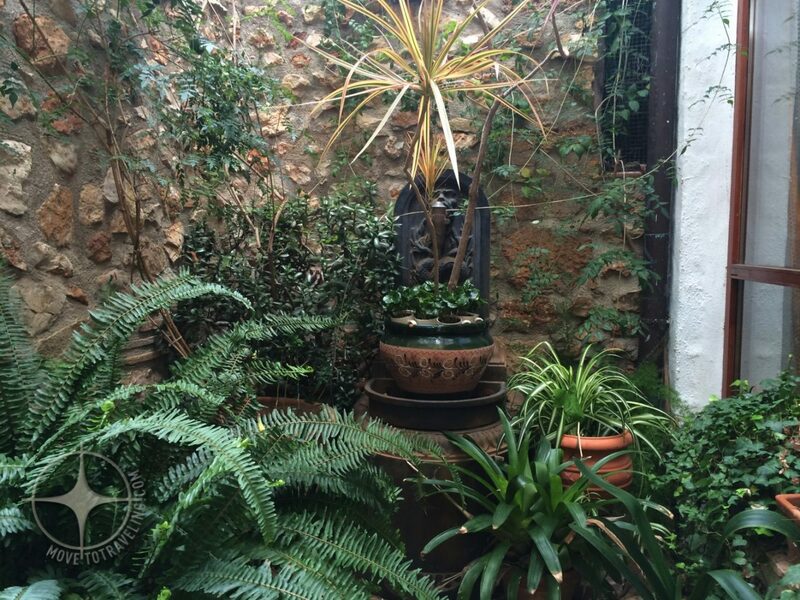 From where we stood we could admire its stone and brick facade and see trees growing in a small enclosed courtyard. the Hotel Nou Romà, it was time to continue on our way. We were also getting hungry and Amparo had in mind a place for us to eat and great streets of the historic district to wander. But this glimpse of Hotel Nou Romà was enough to make us fans of the hotel and eager to return for a longer experience and stay. You can bet that when we do, you’ll be able to read about it here. And hey! 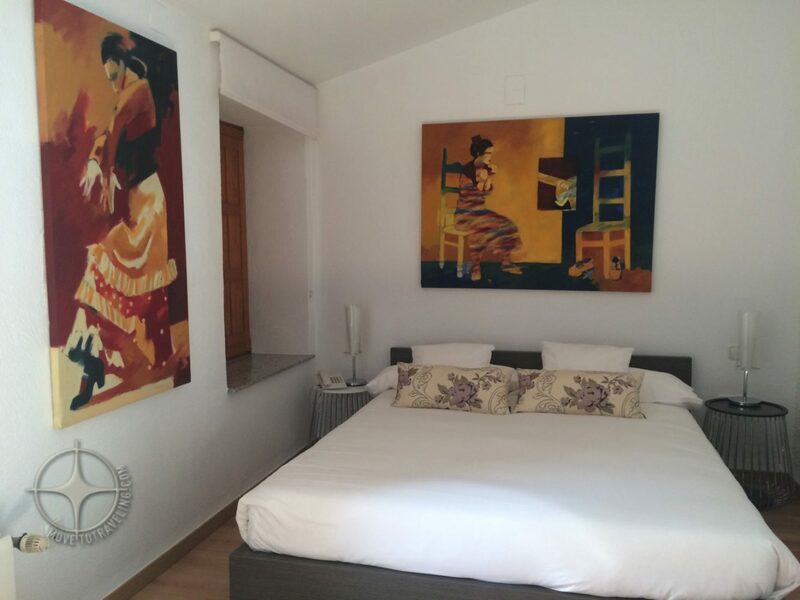 When you visit the Hotel Nou Romà (because obviously now you see that you really should) let them know you read about them in this post. It’s a great way to help each other out as travelers and let local businesses know how people are finding them. Thank you for reading and sharing!